The original of this car was built by Ian Moore in 1952. To make it as narrow as possible, the Oliver motor was shorn of its lugs and a complex gear and bearing arrangement took the drive to the rear wheels. 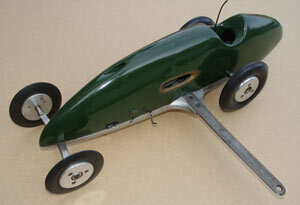 In the 90s, Ivan Prior started producing replica Oliver and other cars, and the Ian Moore Shadow was one of the range. Where is the original? The 'end of the line'. This 'Ian Moore' car from 1954/5 represents the peak of development of the British tethered car. 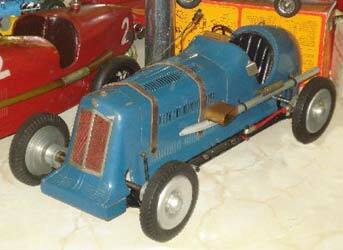 The number 12 chassis, still with its separate gearbox, was given the 'bobtail' treatment. The obligatory Dooling 61 with magneto ignition nestles underneath the balsa body. 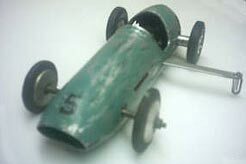 In this configuration the car would exceed 126mph, only beaten by the all American Dooling Arrows and McCoy Teardrops. 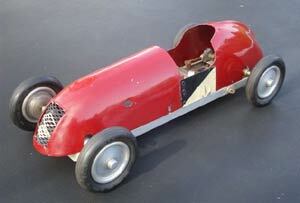 A wooden chassis, OWAT motor, 1066 wheels and tyres, open bevel gearbox and hand crafted body? Although the right size, certainly not a 'Pint', but it does have a stamped plate from Wreford. This presents an interesting prospect. As the 'Pint' did not appear until 1953, was this car used by Mr Wreford, prior to starting production of his cars? Why else would there be a plate with his name and address on what is very obviously a homebuilt car? Has someone stumbled on something quite unique here? In August 1949, J.S. 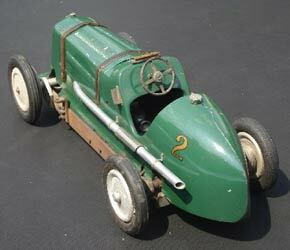 Wreford of Romford introduced the tiny, 'Half Pint' car intended for the 1cc ED Bee engine. The car was similar in many respects to the M&E Wasp, based on a pressed aluminium chassis pan and was available for the princely sum of 45/- (£2.25). A bevel gearbox at the front took drive from the motor and centrifugal clutch mounted under the rear bodywork. 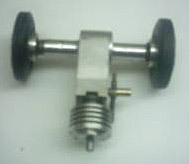 Rear wheels were mounted on separate stub axles. All parts could be bought individually for home construction. This time a semi-scale Ferrari. Turning aero engines into twinshafts for cars was normal practice, and here we see an 2.48cc ED MKIII given the treatment.The motor was very competitive in C class racing at the time, holding the class record at one stage. Sold recently for £850 this Oliver Tiger car was remarkable for the much earlier 'Nine Port' motor, one of the early twinshaft layout engines produced by the Oliver concern. The car also has an interesting history, having come from the collection of the late Gerry Buck. Just like Number 11 buses!! The M&E Models ERA body used to be a very rare discovery, yet two more have come to light in as many months. Even better, this example is on a complete and original M&E chassis as well. More remarkable is that it is on display in a toy museum, and possibly the only tethered car on public view in the UK. Because the car is in a display case, little else is known about it other than a very large exhaust outlet has been added to one side. The ERA body, although a more expensive option to the standard Special or Challenger, is now the 2nd most common of those that have come to our notice. Since sold and appeared in a London gallery at £10,000-£20,000!!!! Where has it been for the last 50 years? Less than one week after Gary Maslin enquired if we had ever tried to discover the whereabouts of any of the tethered car trophies, an email arrived asking if we had any information about the one pictured. 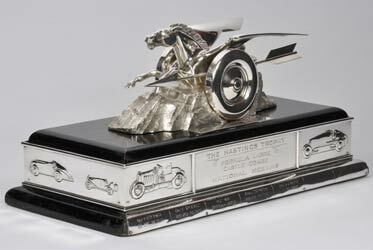 It is the original Hastings Trophy, first awarded in 1948 and then passed to a motor cycle and car club in Bristol. It has survived with the successors to this club and we hope to bring the full story of it in a later article. Nothing was known about this car, other than that it was a tether car with an engine. 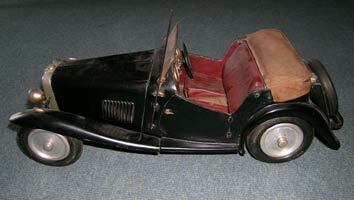 The surprise came when it was unpacked as the body was an original M&E ERA in almost perfect condition. In fact it is by far the best that has ever been discovered. The chassis was home built to the 1066 plan with a selection of commercial parts, including two (E&M) Experimental & Model Co wheels, two standard 1066 wheels and a 1066 gearbox and front axle unit. Motor was a DC Wildcat that had suffered the ravages of time and was missing some vital organs. This was a remarkable find by any standards, especially in the manner it came to light. 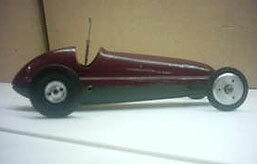 This exquisite scale model of an MG was discovered in a sale room in the north west. 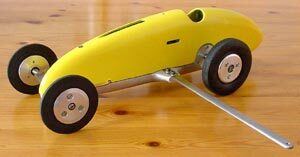 It is around 20" long on 1066 wheels and tyres with a Mills 1.3 motor. The bodywork and all the detailing is absolutely to scale though, including number plate, radiator grill, lights, upholstery and hood. Quite the most lovely scale tethered car that has been seen for a very long while, and the origins of the car and more pictures can be seen by clicking here. For some long while now I have had a niggling thought in my mind about a car which was featured on the website in July 06. 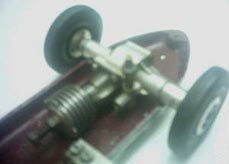 It's a small teardrop car with a PAW 2.5cc engine, and in some recent correspondence with my old friend Chas (Charles) Atkins I confirmed my suspicions...The car was indeed built by Chas, and he produced the body from L63 aircraft grade material. 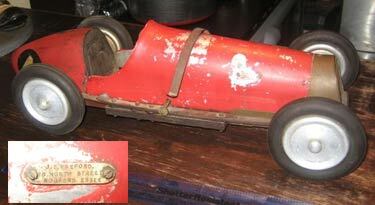 He had a big 'garage sale' some years ago and sold up all his machinery, tools, engines and cars. 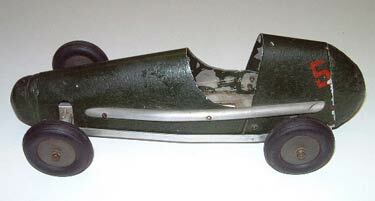 There is not really a connection with the Medway Model Car Club, which folded back around 1960, although Chas does still live in the Medway towns. The car is not a by - product of the Bristol Aeroplane Company, materials would have been 'donated' by Elliot Flight Automation at Rochester! There is only a tenuous connection with Bristol in that that's where I now live! I believe Stu Robinson bought a similar looking 10cc car from Chas. I think this answers the question as to whether anyone recognises the car.